Five Star Entertainment offers a way to level the playing field between your limited budget and the Royal Family’s bulging coffers. It begins with the power of fun. If people are having fun, they’re not focused on how much you spent on the flowers or the food, they’re focused on how great you have made them feel. 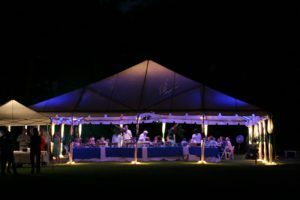 Uplighting transforms a plain hall, or even a tent, into a palace! Five Star Entertainment knows how to create the fun that keeps a dance floor packed and your guests united in celebration of your glorious wedding day. Uplighting is so very elegant. Five Star Entertainment can transform even the plainest hall into a palace. You may not be able to afford Buckingham Palace, but you won’t care, because you’ll be partying in your own dazzling palace right here in North Carolina, or so it will seem. If you want to feel like a princess on your wedding day, it really can happen. It begins with a phone call to Five Star Entertainment: 1-910-323-2409. Let’s start planning your fairy tale today.